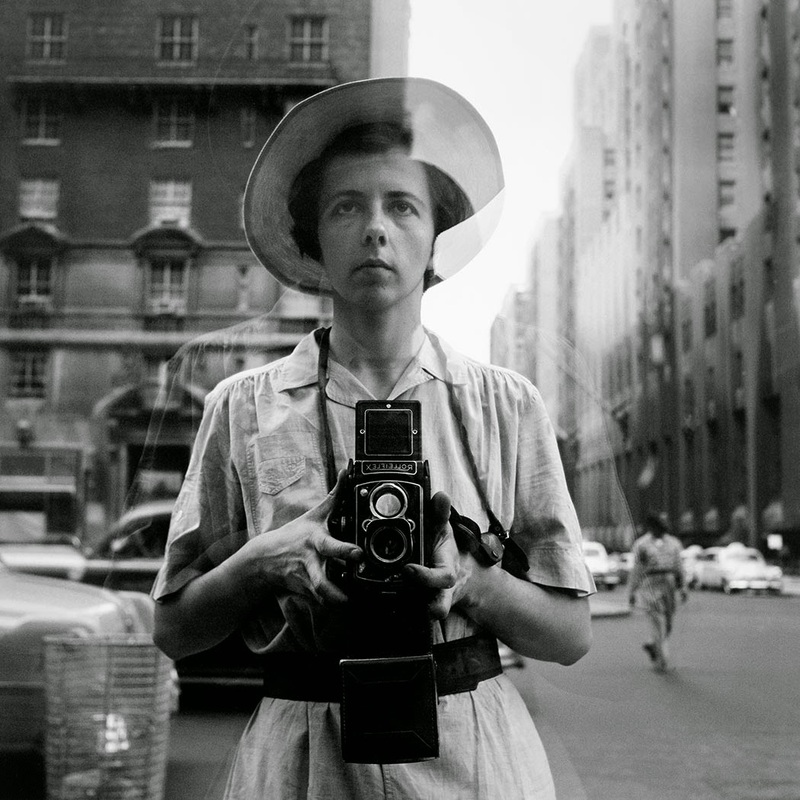 "Finding Vivian Maier" is the story of an exceptional artist who chose obscurity. 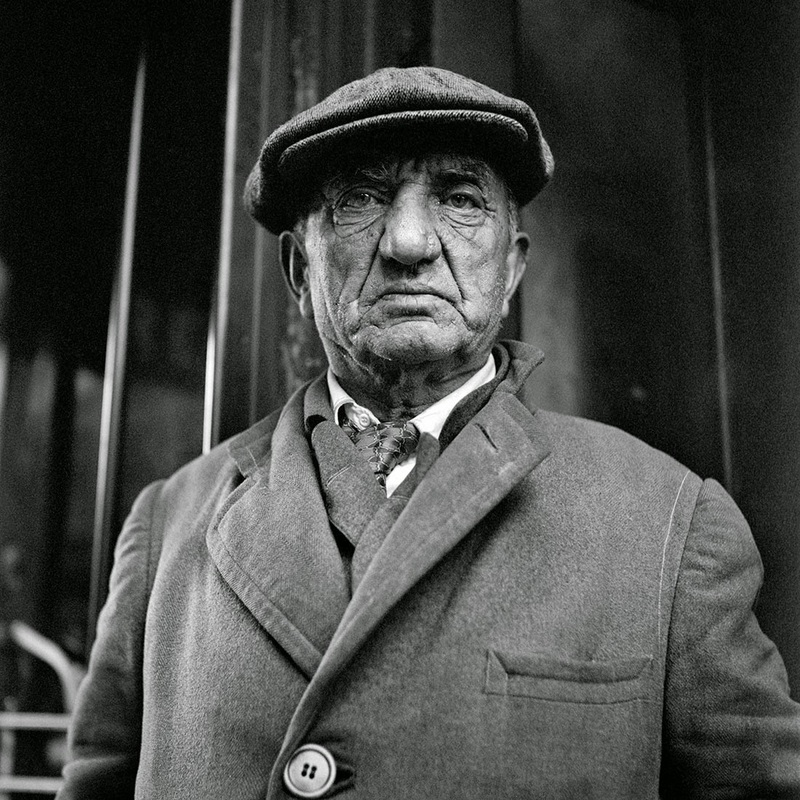 In the winter of 2007, Chicago real estate agent John Maloof bought a box of decades-old negatives at an auction. After seeing the striking images that emerged from the dark room, Maloof (who wrote and directed this movie with a very sure hand) went on an obsessive quest to learn about the photographer—Vivian Maier—and gather up the rest of her output. In the process, he found "100,000 to 150,000 negatives, over 3,000 prints, hundreds of rolls of film, home movies, audio tape interviews, and various other items." of the Maloof Collection, Ltd.
primarily with a Rolleiflex camera which required her to look toward the ground as she framed her shots, even as the lens pointed forward. Though she was not facing her subjects eye-to-eye, Maier was able to capture them in intimate poses, often looking down at the camera, giving the subject an authority over the image. 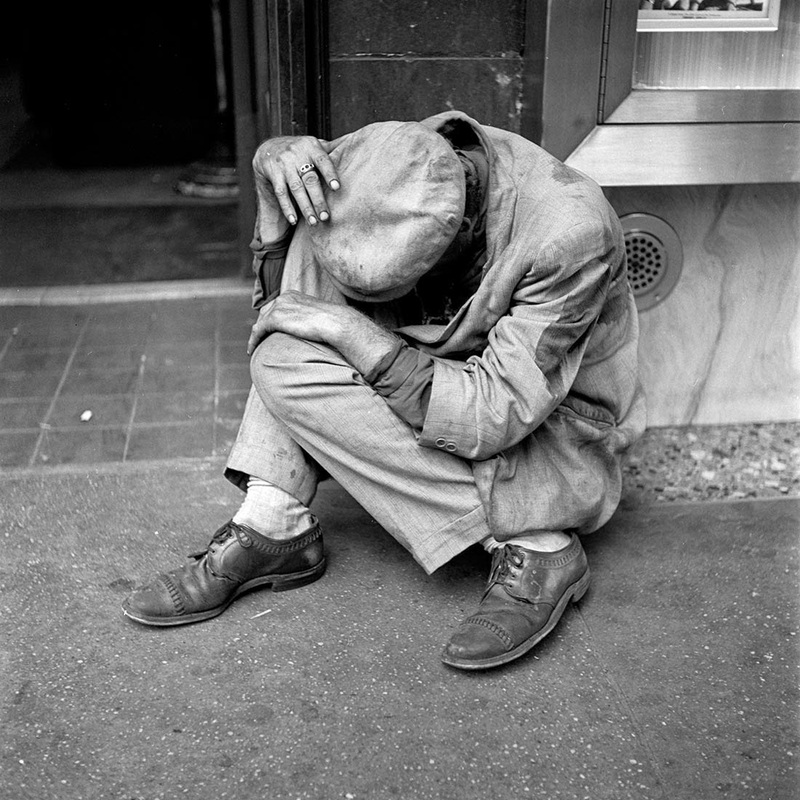 Maier specialized in street portraits and had an acute sense of human folly and human tragedy, particularly the savagery of poverty. While working as a nanny, she took her charges on field trips to slums, stockyards, and even a slaughterhouse. She had few outside friends and the families she worked for were unaware of either the caliber or volume of her work. buried in an ever-growing raft of belongings. After her death, John Maloof acquired Maier's possessions and combed through them like a detective. 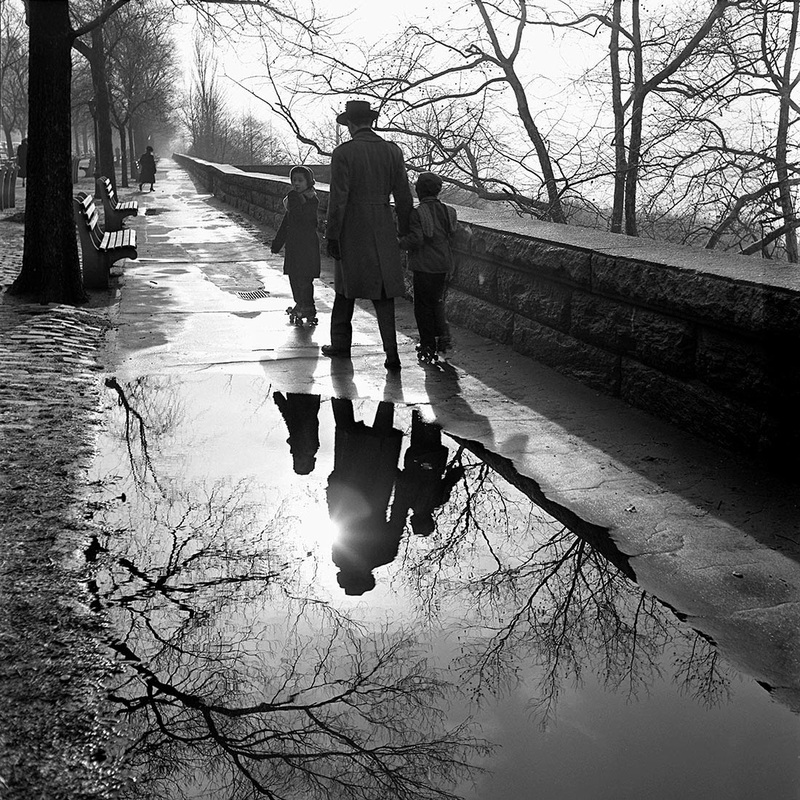 His findings inform the second half of "Finding Vivian Maier." Once the movie has its hooks in the audience, Maloof tries to decode Vivian Maier the person. Maier was intensely private; on some level this pivot feels unseemly, voyeuristic, like secretly reading a shrinking violet's diary. But Maloof has so expertly built up Maier's exquisite photography and the mystery surrounding her being that curiosity trumps the viewer's sense of fair play. A picture of a loner with a crack visual eye forms. Maier's idiosyncrasies and rough edges are revealed and feed speculation about her past, which is by turns intriguing and futile (can we ever truly know what's in someone's heart, especially a loner's?). and London to see Maier's photos years after her death, one could feel a sense of the tragic, as I did when I waited in line at the Van Gogh Museum in Amsterdam. Here was a lonely artist who produced extraordinary work without validation in her lifetime. But in Maier's case, this sentiment might be misplaced. It appears that Maier lived the life she wanted to live and pursued photography from the purest of motives: she found fulfillment—perhaps even joy—in the process of creating art. "There must be something in the water: the magic of 'Muscle Shoals'"
This shot of the famous painted ladies appeared in "A Sunny* Monday in San Francisco," my first photo essay. "A Sunny* Monday" was posted in the early days of this blog, when readership was negligible, so it didn't get the attention it deserved. Thus I'm bringing it out for a second go-round. Since that first posting, I've put up a new photo series every 3-6 months as a nod to my love of visual art and a break from more arduous, cerebral fiction writing. Click here to take a tour of two years' worth of "Truth and Beauty" photo essays.